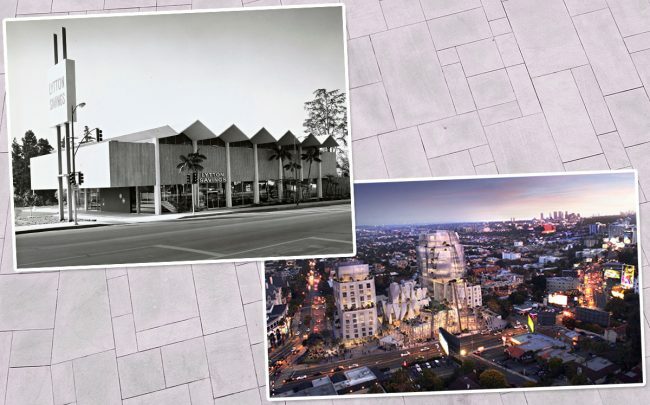 By early May, Townscape Partners will likely demolish a landmark bank in Hollywood in order to build its Frank Gehry-designed mixed-use project. The 180-day stay of demolition that was issued in November expires April 30. Preservationists, however, say they are not giving up efforts to find a new home for Lytton Savings Bank, the 1960s-era building at 8150 Sunset Boulevard, WeHoville reported. Townscape’s project, called 8150 Sunset, will have 229 apartments, with 65,000 square feet of commercial space. Gehry’s distinctive hand is evident, with the design showing his penchant for twists, bulges and waves. Townscape filed for permits in October after winning a two-year court battle with the L.A. Conservancy, which also tried to save the bank that was designated a historic landmark in 2016. The conservancy returned to L.A.’s Cultural Heritage Commission last week requesting another six months to find a site to relocate the building. Another extension can only be approved by the full City Council only after a new location for the bank is found.